These instructions are made using Apple's Safari version 5.1.5 (OSX Lion), but it should be similar for all versions of Safari. Safari will now prompt you with a message "Are you sure you want to empty the cache?" Your Mac will work for a moment, and then the process will be complete. 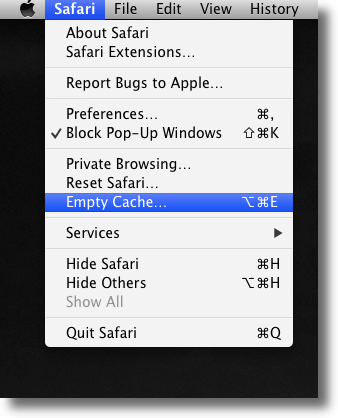 You've now successfully deleted all cache from Safari! Relaunch the browser. If you wish to clear the cache for a different browser/device, please refer to our instructions which can be found here.